A synthetic dataset, appropriate for the evaluation of 3D object recognition algorithms, is provided here. The library contains 20 3D models, with a maximum size of 97.5 cm on average and a set of 34 2.5D synthetic scenes. To generate them, objects were placed together, unsystematically, and a virtual range scanner captured them. The total number of objects placed in one scene varies from three to nine, while the frequency of an object appearing in the scenes is kept constant for all objects. To further increase the complexity of the synthetic scans, the scenes are cluttered with additional objects, not included in the database. 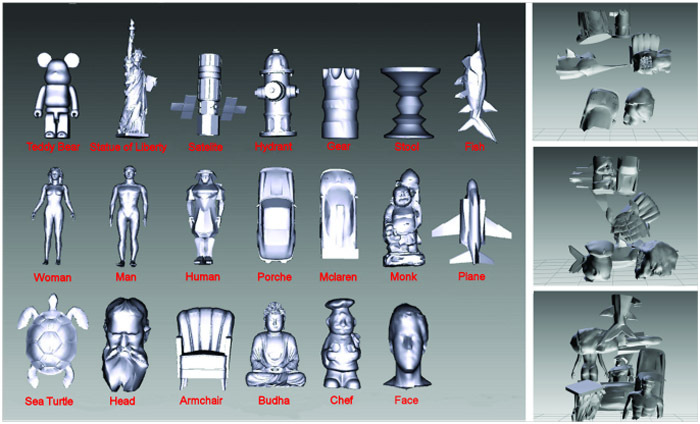 The 3D models and several sample 2.5D scenes are visualized in the figure below.